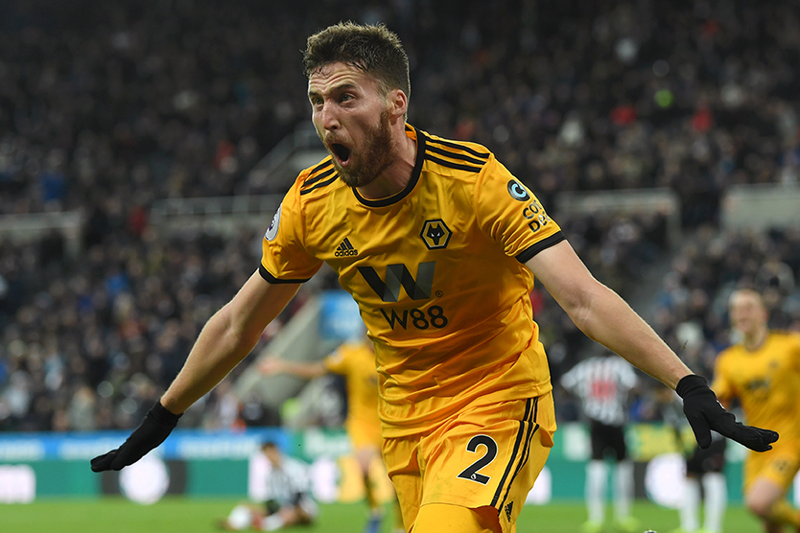 Matt Doherty scored a dramatic winner as Wolverhampton Wanderers battled to a 2-1 victory at 10-man Newcastle United. After Newcastle defender DeAndre Yedlin's 57th-minute red card for a foul on opening goalscorer Diogo Jota, Doherty headed past Martin Dubravka in the fourth minute of stoppage time. Jota opened the scoring on 17 minutes with his second goal in as many Premier League matches when he controlled and finished Helder Costa's cross. But, after Salomon Rondon's free-kick crashed off the underside of the crossbar, the Venezuelan picked up the Wolves clearance and crossed for Ayoze Perez to head in Newcastle's 23rd-minute equaliser. Following Yedlin's dismissal, Wolves substitute Raul Jimenez hit the crossbar with a powerful shot and Doherty had a shot brilliantly saved by Dubravka before he did find the net after Jota's effort was palmed into his path. Wolves move up to 10th place and 22 points with the win. Newcastle are in 15th on 13 points.